One of the cardinal rules of voice recording is to get close to the microphone: a warm, intimate, immediate voice sound is best achieved by positioning the mic 3-6 inches from your mouth. That is in part due to a quirk of directional microphones called the proximity effect. As you get closer to the mic, low frequencies, the big, warm bassy tones so flattering to announcers’ voices, are amplified. Of course, you can go too far with this effect; some voices can get too bassy and dull. Those will benefit from using the bass roll-off switches that certain mics offer, or by having the announcer step back and work the mic from a little further away. 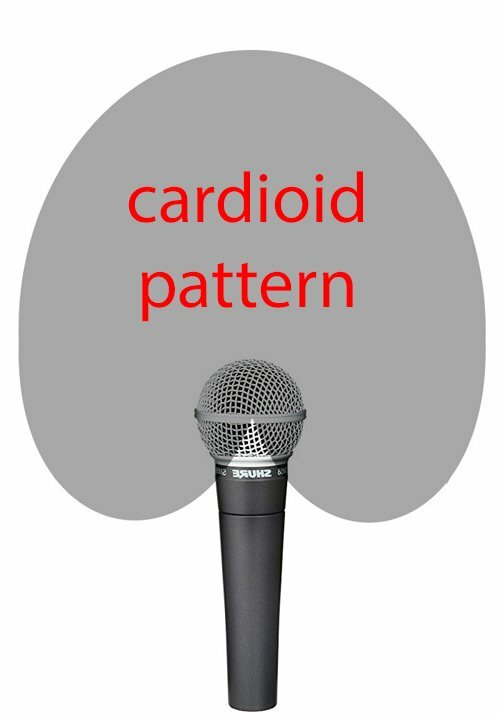 Directional mics are favored for voice recording, particularly those with acardioid pattern, which is most sensitive in a small area in front of the microphone. That pattern focuses the recorded sound on what it’s pointed at, while rejecting sounds from behind the mic and to the sides. This is especially helpful in a live context if the mic is being amplified for an audience. 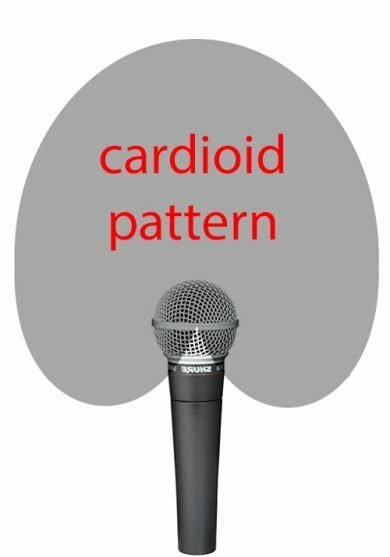 A cardioid pattern, or an even tighter pattern called hypercardioid, allows the speakers to be turned up louder without causing feedback (that ringing or squealing that happens when too much sound from the speakers returns to the microphone). 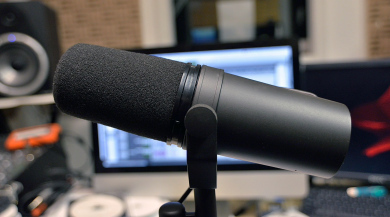 But… There are several negative consequences of getting TOO close to the mic. The proximity effect can result in too much bass, causing a boomy, muffled sound. A bigger problem is the effect of plosives, a bassy, often distorted sound, that results when an air blast from the mouth goes into the microphone. The most common source is the letter P, which is why plosives are sometimes generically referred to as P-Pops. The P sound is the most common offender, but there are plenty of other sounds that cause similar problems — the letter B can be almost as bad. S, TH and F sounds don’t create plosives, but they do cause distortions due to air blowing across the mesh of a mic’s headshell and into the diaphragm. Directional mics are wind-sensitive, you’ll get bassy rumbling and distortion if you’re outdoors in a breeze without a windscreen. Air coming from the mouth affects microphones just the same as wind: it’s important to avoid air blasts into the mic from any source. Hold your hand an inch or two in front of your mouth and speak some words with prominent P-sounds. For instance, “Plosive Problem.” Say the word “Boom!” Try “Fall.” You’ll probably feel a blast of air on your hand when pronouncing those words. That stream of air can create rumbles and distortion on a microphone. P-Pops seem to be increasingly common on the radio and in podcasts, possibly because producers and engineers are trusting too much in their microphones’ (inadequate) built-in pop-filtering. Or perhaps they’re monitoring on small speakers, which might not fully reproduce the low frequency bump that is the signature of a P-Pop. Checking your mix on speakers with a wide frequency response, or on headphones, can be crucial in catching problems you might otherwise miss. 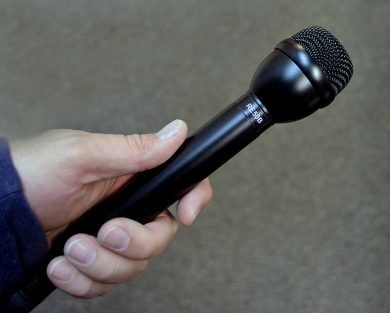 Omnidirectional microphones are less wind-sensitive than directional mics, so if you’re recording in a space that doesn’t suffer from distracting room ambience or echoes, you can try an omni mic (or the omni setting on a switchable multi-pattern microphone.) Omnidirectional mics are not a good choice when using amplification, their large pick-up pattern makes them susceptible to feedback. And those mics are not completely immune from P-Pops and other wind problems, just less likely to create a distracting bassy rumble. Some mics, especially those designed for recording or reproducing the voice, have a special design intended to reduce plosives. 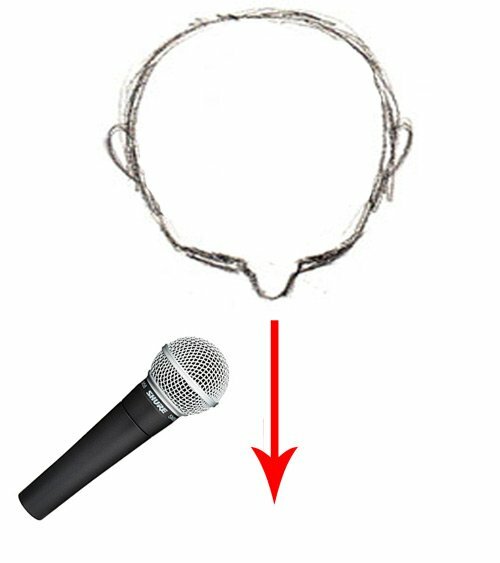 The metal mesh on the front of the mic, known as the “headbasket” can be designed with multiple layers, or lined with foam, or have a special shape that serves to reduce the airflow that hits the microphone capsule, the part of the mic that translates sound waves to electrical signals. But it’s a trade-off: too much protection from wind can also block high frequencies, making a mic sound dull. In practice, headbasket configurations can only do so much: many popular vocal mics do have designs that reduce the severity of P-Pops and other breath noises, but none are are fully resistant. The Electrovoice RE-50 is one of the most successful mics at avoiding plosive problems, but that is due to both the mic’s omni pattern and the headbasket design. This characteristic is partly responsible for the mic’s popularity, it’s probably the most commonly-used interview microphone. But the very behavior that is an asset in the field makes it less attractive as an announce mic. It doesn’t have the same warm, immediate sound that a cardioid mic has, so it’s rarely used to record narration. And its omni pattern makes it unsuited to use with amplification. Most directional mics designed for use on stage with amplification usually have a cardioid pick-up pattern, and headbaskets designed to reduce P-Pops. The classic example of this type of mic is the Shure SM-58, which has a recognizable ball-shaped headbasket, meant to reduce the effects of plosives and other breath sounds. That type of protection does reduce the severity of P-Pops, but does not eliminate them. Some large-diaphragm dynamic mics, such as classic radio-host mics like the Electrovoice RE-20 or Shure SM7B have mesh or foam wind screens built in, that serve to mitigate plosives. BUT it’s still quite easy to P-Pop those mics, you’ll hear it almost every day on the radio. Large-diaphragm condenser mics are very sensitive to wind and breath noises, and almost always require some kind of external pop protection. The bassy distortion from plosives can be avoided with good mic technique. The most effective way to avoid P-Pops is to position the mic “off-axis” which is to say, off to the side, at an angle, rather than directly in front of the mouth. Alternately, you could position the mic slightly above your mouth, but pointing down. (It’s difficult to place a mic below your mouth where it won’t be in the path of breath noise.) That way, any blasts of air go past the front of the mic, not directly into it. 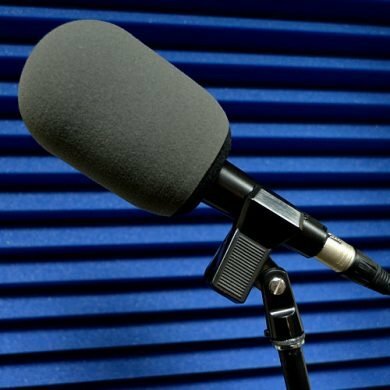 You can still stay close to the mic, ideally 3-6 inches away, which will assure that your voice sounds present and vivid, with not too much room ambience. From that distance, you can take advantage of the “proximity effect” to accentuate the warm, rich components of the voice, without getting overly bassy. The other, more challenging, aspect of technique involves controlling the air that you use when articulating Ps and other problematic sounds. It takes some practice, but you can train yourself to expel less air when articulating troublesome sounds. Put your hand in front of your mouth and give it a try: it’s totally possible to pronounce a P, B F, and other sounds without blowing much air out at the same time. It’s also important to pay attention to your breathing as a whole, not just when you’re articulating words. It’s easy to cause a distracting rumble by simply exhaling into the mic. The surprising source of many problems is exhaling through the nose. Those breaths are often sent in surprising directions, and at a higher force than you’d expect! That’s one of the reasons that it’s safest to position the mic off to the side of your mouth, or pointed down from above, rather than having the mic below your mouth pointing up. Even if you’re careful to position the mic off-axis, and get good at reducing the air you expel when saying problem sounds, you can still end up getting some plosive noise on the mic. So it’s always a good idea to use a windscreen. There are many different types, from simple foam covers, to multi-layer foam sleeves, to fabric or metal mesh screens. A basic foam windscreen can reduce the impact of most plosive noises, but if they’re too thin, they’re not very effective; if they’re too thick, they can block high-frequencies, resulting in a muffled sound. The basic inexpensive foam covers you can find at any music store are better than nothing, but are not very effective at stopping strong plosives. The most effective foam windscreens employ both open-cell and closed-cell foam to create an airspace buffer around the mic. The Shure A81WS is one of those covers that contains both types of foam, and is very good at blocking plosives without dulling the sound too severely. But it has a fairly narrow opening, designed for the Shure SM-81 condenser mic, or, with a little stretching and twisting, the Shure SM-57 dynamic mic. This windscreen is almost comically large, overwhelming the mic itself, but it can block both wind and plosives more effectively than most foam covers. Unfortunately, the opening is too narrow to fit many common microphones, most common handheld mics with a ball-type head will not fit inside this windscreen. But if you use a relatively thin mic, this might be the ultimate foam cover. The furry wind covers designed for outdoor use in high wind can be effective at blocking plosives too, but it just feels weird to have a big fuzzy windscreen up close to your mouth. That style of wind cover can be distracting in interviews or voiceover applications. 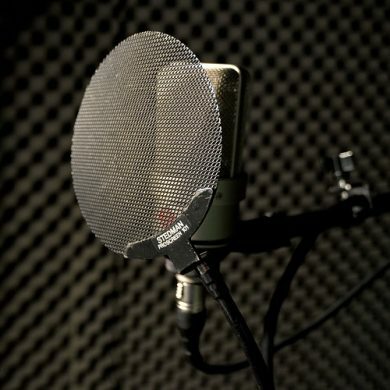 More appropriate are fabric or metal mesh windscreens (small hoops with nylon stretched across them, or perforated metal discs) which are very good at blocking plosives while remaining acoustically transparent. Both diffuse air currents passing through them. Dual-layer fabric screens are especially effective. They must be positioned correctly, about an inch or two away from the mic, and strong blasts of air can still make it through the mesh. 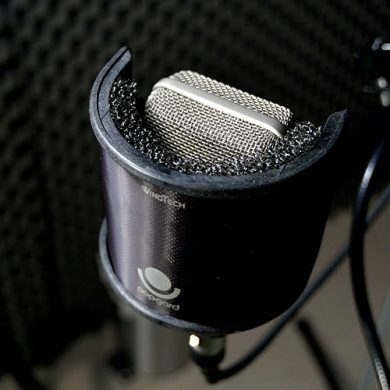 This style of pop filter, usually positioned in front of the mic on a gooseneck, can be visually obtrusive, so they may not be practical in circumstances where there are live audiences, or if the event is being recorded on video. And they only really work when the mic is stationary, on a stand, not with hand-held mics. Pop-filter with extra open-cell foam. A few companies make small metal mesh screens that can attach to a side-address microphone with elastic bands, and therefore be less visually obtrusive. They work fairly well, but the mesh is positioned so close to the microphone that strong plosives can still pass through. I’ve hot-rodded this style of screen by adding an additional layer of open-cell foam, and a small Kevlar fabric disc called a “Popper Stopper” which reduces some of the blow-through, making these more-compact windscreens slightly more effective. This style of screen is designed for “side-address” microphones, usually large-diaphragm mics that are positioned upright, and you speak into the side of the mic, not the end. Handheld mics, or classic “end-address” mics such as the Shure SM7B or Electrovoice RE20 can’t use this kind of apparatus, the elastic suspension that attaches the screen to the mic isn’t designed to grip onto an end-address mic. Plosive distortion can be reduced by making the microphone less sensitive to low frequencies. Some mics have a bass roll-off switch, which won’t eliminate the problem, but can make it less severe. Similarly, using an equalizer to reduce the bass frequencies when recording can lessen the impact of P-Pops. Sometimes, no matter what precautions you’ve taken when recording, you still end up with some P-Pops on your audio. You can see them on your digital editor’s waveform display as large volume spikes, and they register as extremely loud on your level meters. If you don’t fix these spikes, it will throw off your overall mix levels, and be unpleasant to listen to, especially on speakers with good bass response. These volume peaks can also cause compressors or limiters to react severely, creating unnatural-sounding volume fluctuations. You can sometimes get away with simply editing out the large bassy blast of wind that follows the initial attack of the P (or similar sound). You need to keep the very beginning of the sound, the “attack” of the P, and delete only the big bassy burst that follows. But deleting part of the sound can sound jumpy, and can cause sync issues if you’re working with multitrack audio or synchronizing with video. A better approach is to use an equalizer. Highlight the problematic area — the large volume spike — and apply a “High-Pass Filter,” which reduces the low frequencies that are creating the thump and distortion. You may need to experiment with the frequency setting of the high pass filter. Ideally you want to only reduce as much low-frequency energy as is absolutely necessary. 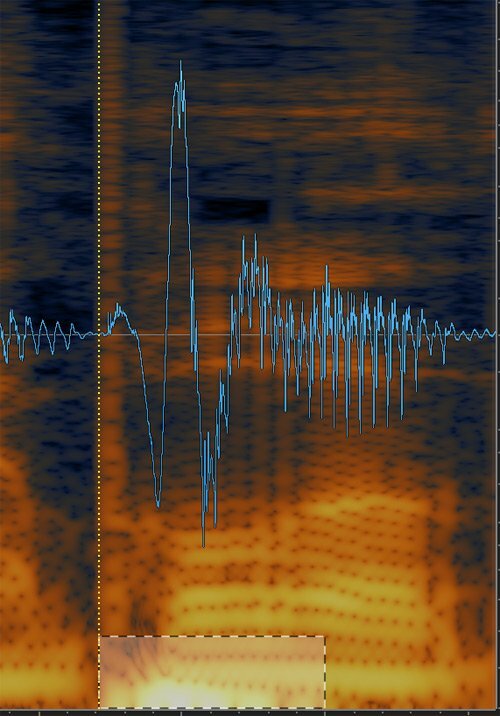 The exact frequency where the P-Pop is reduced, and the resulting sound is natural, will vary. One hundred hz is a good starting point, but you can try a lower frequency if the pop-removal sounds too thin, or a higher one if the processed pop still creates a bassy thump. This technique only removes the low frequency bump, there may be other distortion artifacts from the plosive blowing across the mic’s headbasket, but removing the low frequencies is usually a big improvement. You want to apply this effect to only that small area of audio, not the entire track. In Pro Tools, you’ll want to use an Audiosuite effect, which renders the filter on the highlighted area. Other editing programs have similar ways of applying an effect to a specific region of audio. Or you may be able to automate an EQ, raising the frequency of a high-pass EQ at the moment of the P-Pop, then lowering the frequency again, to create a similar effect. When applying a processor to a section of a sound, it’s often helpful to highlight a slightly larger region than where you want to apply the effect: that way you have some room to adjust the edit points, or apply crossfades, if applying the EQ creates a thump or click. Recent versions of Pro Tools automatically create “handles” on both sides of a highlighted region, to allow small adjustments to the edit points. Reducing the low frequencies makes enough of a change in the sound file that there often is a thump or other noticeable noise at the transition points between the original audio and the EQ-ed audio. A small crossfade on each edge will usually solve that problem. Hindenburg Journalist does not have a way to apply an EQ to only a designated portion of a clip, or to automate effects, but there is a work-around. Make a new track right below your voice track, and put an EQ plug-in on that track. Set the EQ to act as a High-Pass filter (by default the Hindenburg EQ applies a high-pass filter, it’s indicated by the dip-down on the left end of the blue line in the EQ window.) You can adjust the frequency of the filter by clicking and dragging on the curved edge of the line. Try placing that curve at somewhere just above 100 hz. Then, whenever you encounter a P-Pop, highlight the bassy peak, and make it a new segment (Command B). Then, move that new small clip down onto the new track with the EQ by using the Command key and Down arrow, so that the clip does not move forward to backward in time, just down onto the new track with the EQ. You may find that short fades on the edges of the segments will make this technique sound smoother. To make sure that the chopped-up sound doesn’t get out-of-sync, highlight all parts of the clip on both tracks and group them together (Command G). 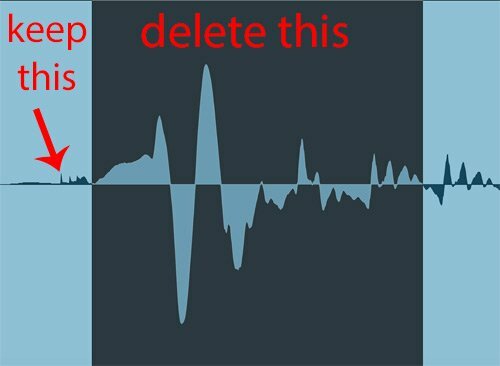 An even more efficient way to deal with plosives is to use processing specifically designed to fix the problem. Izotope Audio RX is a sophisticated tool for cleaning up many audio problems. In Audio RX 5 Advanced, they added a “de-plosive” module that can remove P-Pops and other momentary low-frequency noises. The advanced version of the software is expensive, but if this kind of processing, along with other kinds of noise-reduction and audio repair, is something you need to do on a regular basis, it can quickly become worthwhile. The de-plosive processing is very quick and effective, acting only on the defined low-frequencies. You simply find the section of audio that is affected by the plosive noise — it’s pretty easy to locate, either by the large peak in the audio level, as indicated by the jagged blue line, or by the bright yellow highlight at the bottom of the colorful “spectral” display, which indicates a large amount of energy in the low, bassy frequencies. By highlighting that area, then running the De-Plosive module, the offending audio peak and bass bump are reduced or eliminated, while leaving other aspects of the sound relatively untouched. This mode of processing allows removal of fairly severe plosive sounds without impacting the rest of the audio too severely. Reducing a large bass blast can create an audible “bump” so it may take some experimenting to find the right setting. 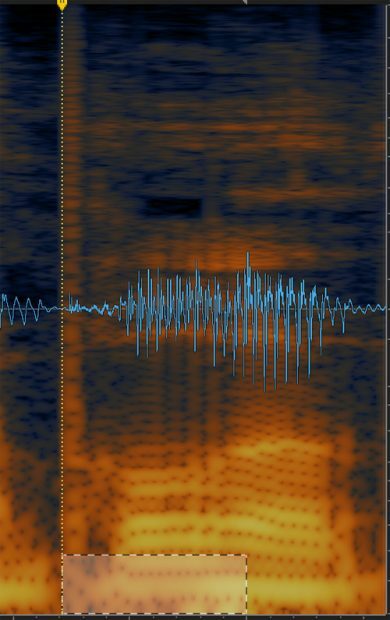 Severe plosives often create other distortion on the microphone, not just a bassy thump, so you’re often left with some lingering effect of the P-Pop (which is why it’s a good idea to try to prevent the plosives in the first place!) but this kind of processing can reduce the severity of the plosive distortion. If you have a different version of Audio Rx, one that does not contain the de-plosive module, you might have luck with the “Spectral Repair” section. Highlight the low frequency bright spot, and choose “attenuate.” If you find the right combination of settings, you may be able to get similar results. As amazing as this tool is, it can’t repair all plosives — some blasts of air create distortion that cannot be fixed completely after the fact. Izotope does a very good job at smoothly removing the troublesome bump of low frequency energy that is the most problematic aspect of a P-Pop. We’re still looking for acoustically transparent, yet effective, windscreens that can prevent plosives and other wind noise from affecting the microphone. For now, a combination of good mic technique and a good enough windscreen is the best path. If you’ve got an effective technique for preventing P-Pops, or fixing them in the mix, please share them in the comments! In any case, get a good pop filter, and position your mic off-axis, and you should be able to avoid the biggest problems! 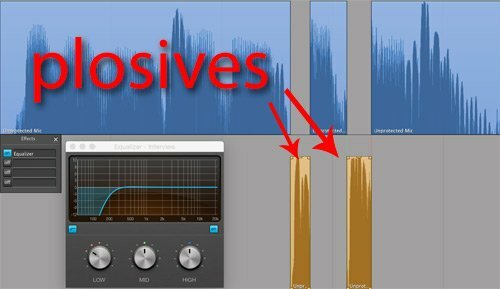 Transom Tools reports are getting to be like Google ads: Just after I used RX5’s De-Plosive tool on a P pop that wouldn’t respond to simpler treatments this morning, up pops a notice in my email that leads to Jeff Towne’s wonderfully comprehensive description of plosives and how to avoid or treat them! Well played, Jeff. Include T in the list of dangerous consonants. People sometimes move the mike down directly below their mouths to avoid the wind blasts from P’s, and that helps for many consonants, but this puts the mike right in the path of wind from T’s. It’s the same wind, but it’s being diverted off the back side of the upper teeth in a downward direction. The Shure A81WS windscreen is a wonderful tool I have used with a whole lot of mike models. But I don’t think it, or any windscreen, uses closed cell foam. It’s just different densities of open cell foam. Closed cell foam would block too much of the high frequencies that we need for intelligibility. Rycote’s Super Softies are a more recent product that uses more rigid low density open cell foam to get better blast protection with less loss of highs. I have found the Electrovoice RE-16, with the optional EV model 376 windscreen to be a combination that is almost immune to P-pops. The RE-16 is one of EV’s “variable-D” microphones, which means that it has far less proximity effect than most directional microphones. It also has a built-in wire headbasket that is pretty effective by itself in reducing P-pops. Add the 376 windscreen and you have a directional mic that can be used in the field, very close to the mouth, which is really great for suppressing the acoustics of untreated rooms, etc. It’s my secret weapon on tape syncs. Thanks Robert, I’ll have to check out both that EV mic and the windscreen. It seems like there should be a simple solution for this problem, but most mics still allow a bit of plosive noise, regardless of their headbasket design, and foam covers tend to muffle the sound if they’re effective… The Shure A81WS is effective, but not a great size for everything…. but I have hope! Thanks Flawn, your comments are very helpful, as always! You’re absolutely right about T sounds being problematic (just put your hand down by your chin and say “top teacher tournament” or something T-heavy and you’ll feel plenty of wind. Yet another good reason to avoid placing the mic right below the mouth: off to the side or angled-down from above is safer, for sure. And you’re probably right about the terminology for the foam in the Shure A81WS: there are two types in there for sure, one more open than the other, but it’s certainly possible that neither of them is “closed-cell.” I thought I was just quoting a description from a product page somewhere, but I can’t find it now. Have you found any similarly affective windscreens for larger mics, especially ones with ball-type ends, such as an SM-58? This is great stuff. I learned a lot even though I’ve been making recordings since the early 60’s. Never heard the term “headbasket.” I flashed on a guillotine output device. Jeff, you should do a separate piece on sibilance reduction. As far as I know sibilance cannot be attenuated with mic placement. It can only be reduced by processing, either with a plug in or with a hardware de-esser like one from Drawmer, which is installed in my studio. My impression is that plugins are more effective. (Bob, please comment on this issue). Hi Jeff, Plosives are my biggest problem right now and I am working on reducing them. I use a Rode NT-1a with shock mount and pop filter. This is a good setup, but to get the best out of my voice, I need to be up close and personal with the mic. This means that even with the pop filter and the mic at an angle, I still get some plosives. I might try to ‘hot rod’ the mic, by applying a piece of open-celled foam like you did. My question then is where do you get such foam? Many thanks, David. Hi David, before you add another layer of foam, which can indeed help, but can muffle the sound a bit too, I’d try a few more technique things first. Even if your voice sounds best up-close, try backing the pop-filter away from the mic by just a little more, and also, try an even more extreme angle: position the mic literally half-way between your nose and ear, directly off your cheek. Continue to speak directly forward (maybe put your script right in front of you, if you’re using one, if not, perhaps just a note to remind yourself to face forward and not toward the mic!) As you’re figuring out the best position, put your hand up in front of your mouth so you can feel where your particular plosives are going, and make sure to aim them past the mic, not directly into the pop filter. There’s only so much that those can catch! You sometimes see announcers speaking over or under the mic, so that’s something you could try too: position the mic lower than you normally would, and talk over the top of it. That;s tricky, because breath sounds quite commonly go down, including random nose-exhales! So, preferably, flip the mic upside down, and hang it up a little higher than you would normally put it, aiming down, and speak under it. If none of that works, I’m sure there are several sources for foam that might help, but what I’ve used is replacement foam for a Rycote InVision pop filter. http://www.bhphotovideo.com/c/product/766039-REG/Rycote_045004_InVision_Universal_Pop_Filter.html/BI/19993/KBID/13271 That foam seems to do a good job knocking down breath noise without dulling the sound too badly. Good luck! I hope one, or more, of these techniques can help! Interesting article Many thanks. Having criticism of plosives in my narration so will start by moving the Mike off centre and re positioning my sound popper and keep at it. I have produced several audio books without this problem before so not sure what’s changed. Anyway thanks for your article. I have demos on ACX, voice 123 and Voice Bunny. Thanks so much for this article! I’ve struggled with “p’s” for years. High-Pass filters can only do so much and I can’t afford the version of RX with the de-ploder so I am going to give you Spectral Repair idea a try!